It seems like yesterday when I launched my business full-time. That was over two and a half years ago. It seems like yesterday when our twins were born. That was seven and a half years ago. It seems like yesterday when our oldest son was born. It seems like yesterday when Karen and I traveled to the UK. It seems like yesterday when I completed my life coach training. That was about 13 years ago. It seems like yesterday when I married my beautiful wife and started our wonderful adventure together. That was almost 19 years ago. It seems like yesterday when I was young and fit and graduating from high school. That was about 25 years ago. Gee it’s gone fast and it’s been a great ride so far, but with the reminder that time goes quickly comes the reminder that it’s easy to let time slip through our fingers. 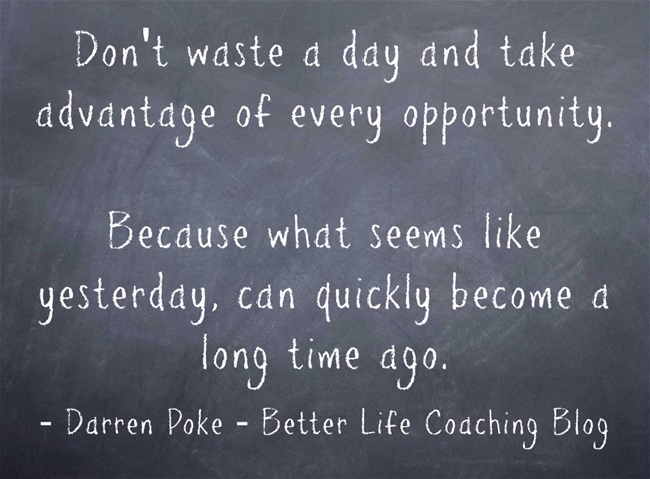 So don’t waste a day and take advantage of every opportunity. Because what seems like yesterday, can quickly become a long time ago. Previous post – Do You Take Dictation, Or Are You Writing the Script? « Do You Take Dictation, Or Are You Writing the Script?